Mark Sandmeier was the first person to be employed by jobs.ch. He now spends his time helping young digital companies get on their feet. What is my job? "I'm the CEO of a start-up," says the affable man with the open face. "CEO sounds fine, but I didn't like 'Managing Director' at all," he adds with a laugh. 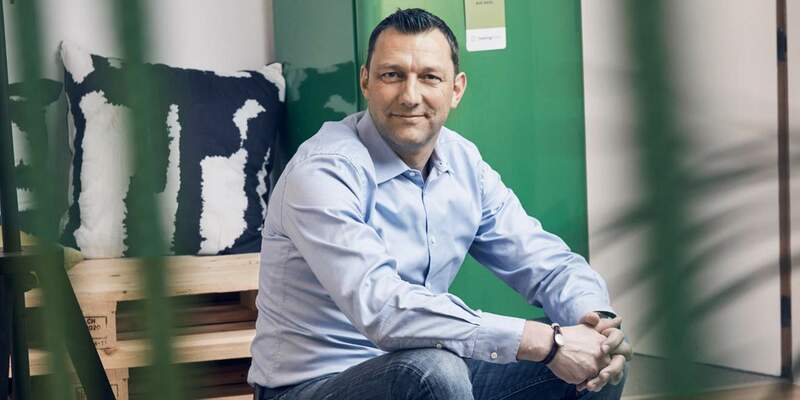 Mark Sandmeier – jeans, shirt, jacket – sits in a small boardroom of modern, Scandinavian snugness that belongs to one of the 15 start-ups in which he has participated in recent years. He holds one CEO position and three supervisory board posts and is a coach, consultant and dormant partner at other start-ups. This one is called TestingTime, and Sandmeier is a supervisory board member and investor. The start-up runs a platform where businesses can find people to test their products. They may be seeking Digital Natives in Greater Cologne to test a new app, or young, breastfeeding women in Amsterdam for a breast milk pump. For Sandmeier to be interested in a start-up it has to fulfill clear criteria: "Anything which is not digital or digitally supported is out. Fintech and healthcare are also out because I understand them too little," says the entrepreneur. One out of ten concepts has to sound very exciting, and it's very much about the people too. "Instinct and trust are essential for this." He cannot give us ten perfect-sounding take-home messages that encapsulate his business philosophy, except perhaps this: Success consists of many pieces of a puzzle which have to fit together, and what you have to do is keep finding out what exactly is needed as you go along. Although many services are automated nowadays, nothing can replace human contact. Passion as Driving Force In the end he cares about simple, fundamental things in his career: "I want to do something I enjoy and that I have a passion for. Passion is the key anyway," says Mark Sandmeier, who helped drive the digital transformation of the Swiss media landscape and lived through it with jobs.ch. Suddenly it was easier, better and cheaper to look for a new employee not by posting newspaper ads but on the Internet instead. Digitalization supported and improved a service and the bringing-together of supply and demand. "It was disruptive, so it did give us a bad conscience from time to time," says Sandmeier in retrospect. Traditional media corporations suffered under the new providers. The irony is that those same large media houses, who were put under such pressure when job advertisements and other small classifieds moved onto the Internet, later bought up portals like jobs.ch. Mark Sandmeier prefers the phase of a business in which the foundations are laid for later success. "I was the third member after the two founders of jobs.ch, and I was the first employee to be brought on board. Until you grow to 20 people, every single person is equally important. Once you get to 50 or 60 employees, it becomes difficult and you can no longer lead directly; individuals can hide," he says. He likes situations involving a sheet of blank paper that needs to be filled. "Initiating something, learning from mistakes, questioning everything, then bringing it forward. But once something gets too big and complicated, it's no longer for me," adds Sandmeier. These, he says, are typical Swiss virtues which he tries to cultivate. "Don't grow too quickly, advance step by step." His most recent involvement has been in a company called Picstars, whose business concept he did not understand at first, as he frankly admits. It's about bringing together brands and potential brand ambassadors – on an Internet platform of course. Mark Sandmeier was approached as a potential investor in 2015; he had the product explained to him in detail before he could understand it. Only then did he begin to advise the company. In the end he became part of the team as CEO. Picstars, he says, is a digitally oriented company but in the end it's all about satisfying the needs of customers. And although many services are automated nowadays, nothing can replace human contact. His own life, explains Sandmeier, is partially digitalized; a robot mows his lawn and an app allows him to control the heating in his vacation home. And yes, he probably will be reading all his newspaper articles on a mobile device at some point, a trusted person having chosen them for him. "But I enjoy putting my cellphone away in the evening and eating supper with my wife and children in the traditional, analog way." He began his career with a commercial apprenticeship at a cable manufacturing company in Brugg. He has various other courses under his belt such as an Executive MBA from the University of St. Gallen, and he's not your typical fully digitalized manager. Instead he gives the impression of an entrepreneurial people lover who understood early and quickly that the future lies in creating perfect interfaces between analog and digital worlds. Is active "Passion is the key"